This level has medium difficulty. 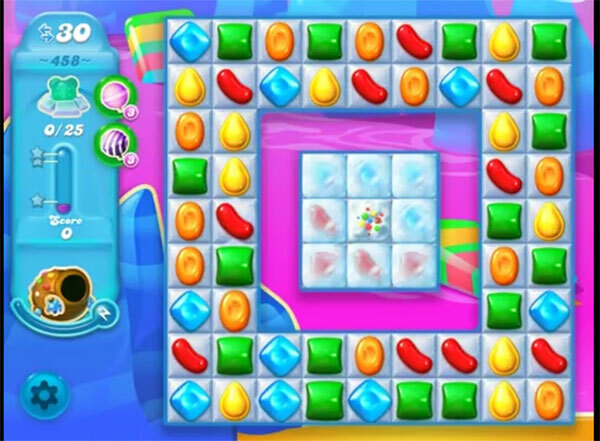 For this level try to play from corner of the board and try to make striped candy or fish combo. Like combine striped candy with colorbomb or wrapped candy to break the center snow blockers. Or play near to snow blockers to break them to find the bears. The level 458 does not look the same on my ipad as the on one in your tutorials. Mine has more layers in the center to break through. I think that is unfair to give tips, when yours looks easier than the actual one that I have to work on. I have been trying to complete this level for several days. I am just about to give up and delete the whole game. It is disgusting to not to have the same chance when the tips game is different than the real game. I agree with above – the centre is much harder to break through than shown on any tutorial. Everything done in this video is what I’m doing. Lots of fish and striped candy. But my fish only ear inside box after outside is done. And I cannot seem to get any of the color bombs. This video is nothing like the real game which is harder and has an extra layer of ice to break in the center. Color bombs don’t happen. Fish will never go to the center unless all other ice is gone. And, if you do set up where you can accomplish a big score, the game will fail to complete it. I’ve been trying this level for literally MONTHS. I’m going to go find a different game to play because this one isn’t consistent or fair. I play candy soda on a laptop and I am sick of the fact that I get NO free boosters to help me. My friend who plays on her phone always gets free boosters so it is very unfair that it is not consistent. Free boosters should be given to EVERYONE irrespective of what soda is played on !!!! Also level 458 is impossible to pass !!!! I just want to say that- if I’m not mistaken- the person whose site this is, is not affiliated with King who makes the game. Am I right?! So, complaining about it here isn’t going to get much traction. Correct me if I’m wrong! Even if King was associated with this site, complaining probably won’t help. They want $$$ for the game and content to piss off a certain percentage because they know another certain percentage is stupid enough to pay for it. I play on a MacBook Pro and never get any free boosters. Also, the tips offered here are not helpful because the boards shown are easier or do not show the same number of levels of ice. It is possible that after some unknown number of games the system just “gives” it to you independent of your play… but that is also not satisfying. Too bad, it’s colorful and has some fun elements, but I’m leaving too.